I watched President Trump’s speech last night. It was the first time I could bear to watch a presidential speech in years. And I was floored. Trump did indeed cement himself as President last night… his words echoed Ronald Reagan and it was epic. It set the nation on a new path. He remained professional and on point even when he was hissed by Democrats when he walked into the chamber. He waxed eloquent even when the Dems gasped that he had set up an office for the victims of criminal illegal aliens. When Democrats rolled their eyes and refused to stand or clap, President Trump carried on and didn’t even pause over it. And the Republicans went wild. I haven’t seen that much enthusiasm in many, many years. He made me proud and brought tears to my eyes. There were a number of thunderous things that happened last night, but the one that personally impressed me were the comments from CNN’s commie Van Jones. He said he may not agree with Trump, but he became President last night. Truer words were never spoken. If President Trump keeps this tone and his promises, he will go down in history as a President in the same class as Ronald Reagan. A snap poll shows that 78% responded favorably to that speech last night. I have to believe it was even more than that. It spoke of Teddy Roosevelt and others before him. And it was delivered pitch perfectly. 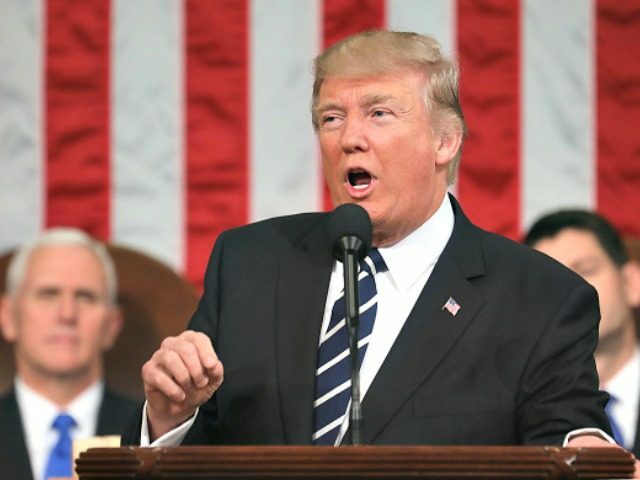 President Donald Trump came to Capitol Hill Tuesday night to deliver an address to a joint session of Congress as a president stalked by controversy. He left it a leader awash in praise. Trump is giving a muscular speech. Passionate both about vetting/killing terrorists and economic renewal, from factory towns to coal mines. Wallace’s comments were echoed by Van Jones, a CNN contributor, who believed the night’s transformative moment came when Trump honored Carryn Owens, the widow of fallen Navy SEAL William ‘Ryan’ Owens. “I oppose and will oppose, but he did something you can’t take away from him, he became president of the United State,” Jones said. Van Jones continued: “… that was one of the most extraordinary moments you have ever seen in American politics, period. And he did something extraordinary, and for people who have been hoping that he would become unifying, hoping that he might find some way to become presidential, they should be happy with that moment.” Trump asked all of America to unite last night… to put aside their petty differences and focus on the nation. It was extremely unifying to all except the most die-hard on the left. Jones said Trump defied critics who seek to reduce him to a caricature. “That thing you just saw him do, if he finds way to do that over and over again, he’ll be there eight years,” Jones said. Hell has truly frozen over… Van Jones and I are now in full agreement at long last. The Democrats did themselves no favors last night. They became the party of hate. They truly showed that as they refused to stand or clap for the widow of fallen Navy SEAL William ‘Ryan’ Owens. They hated his widow because she prayed and looked to heaven during the speech and it sent the left into an apoplectic rage. Good. All of America got to see their true face last night. Trump honoring Owens was the pinnacle of his speech and it was historic. One more thing before I sign off… President Trump did one of the classiest things last night I have ever seen. He recognized the First Lady Melania as he began his speech. Last night, Trump was a statesman who opened a new chapter for our country. Today, he is a President with much to do and I have a feeling he does not suffer Democratic fools well. He’s right… this is a political earthquake and the ground is still moving.